Have the incredible power of Gemstones and Crystals. Whether it's Confidence, Energy, Focus, Success, or other various Benefits that you seek, there is a Gemstones and Crystals for you. St. Hildegard of Bingen, the noted lithologist, declared, All the green of nature is concentrated within the Emerald. Representing youth in the age of man, the power of this lush crystal stirs the soul like the heart of spring, symbolizing hope and the future, renewal and growth. It is a Seeker of Love and a Revealer of Truth, inspiring an ongoing search for meaning, justice, compassion and harmony. 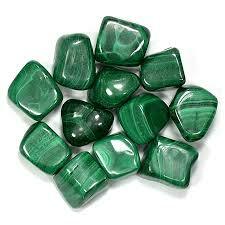 Called the Stone of Successful Love, Emerald opens and nurtures the heart and the Heart Chakra. Its soothing energy provides healing to all levels of the being, bringing freshness and vitality to the spirit. A stone of inspiration and infinite patience, it embodies unity, compassion and unconditional love. Emerald promotes friendship, balance between partners, and is particularly known for providing domestic bliss, contentment and loyalty. It was dedicated in the ancient world to the goddess Venus for its ability to insure security in love. Emerald is also a stone of great vision and intuition, associated with the eyes and sight, long believed to foretell future events and reveal one’s truths. It is a stone of wisdom, enhancing memory and increasing mental clarity. It combines intelligence with discernment, and brings to the conscious mind what is unconsciously known. Emerald also increases focus and intent, activating psychic abilities and opening clairvoyance. Traditionally it was used as a protection against enchantment and spells. 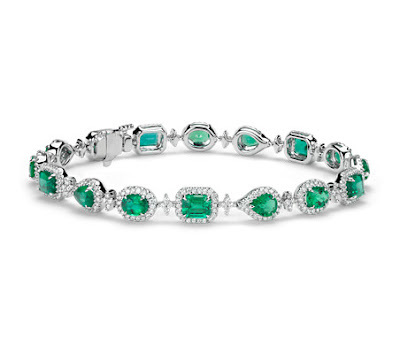 Emerald has been a source of fascination and reverence in many cultures for over six thousand years, sold in the markets of Babylon as early as 4,000 B.C. It was a stone worshipped by the Incas, believed by the Chaldeans to contain a goddess, and was highly honored in all major religions for its spiritual power and beauty. Emerald was considered a symbol of eternal life in ancient Egypt, a gift of Thoth, the god of wisdom, and was a favorite jewel of Queen Cleopatra. The Emerald mines in Upper Egypt, rediscovered a hundred years ago, are some of the oldest in the world and were called Cleopatra’s mines for her love of the stone. Emeralds were also talismans of Aristotle, Alexander the Great, Charlemagne, and the moguls of India. They’ve adorned the crowns and royal jewels of many countries for centuries, and fabulous collections and stunning gems continue to be treasured and displayed by the rich and famous today. Natural, transparent Emerald is one of four “precious” gemstones (including Diamond, Ruby and Sapphire), and is the green variety of Beryl, a beryllium aluminum silicate mineral colored by trace amounts of chromium and/or vanadium. Emerald occurs in hues ranging from yellow-green to blue-green, with the finest being a pure verdant green hue, medium to dark in tone. Light colored gems are usually known by the species name, Green Beryl. Most Emeralds are highly included with surface breaking fissures, so their toughness, or resistance to breakage, is usually classified as generally poor. According to Indian lore, the name Emerald was first translated from Sanskrit as Marakata, meaning the green of growing things. The term we use today is believed to derive from an ancient Persian word that translated to the Greek as Smaragdus, meaning “green stone,” the term used in antiquity and referred to a number of other green stones. 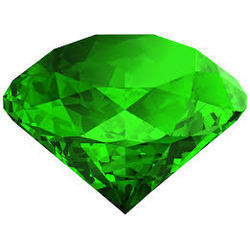 Over time the Old French or Vulgar Latin versions, Esmeraulde, Esmaralda or Esmaraldus became the current name, Emerald. 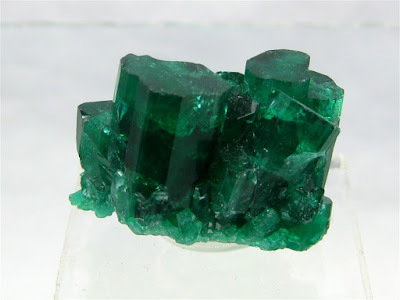 While Emerald, the green variety of Beryl, may perhaps be the most famous of the family, Beryl also forms in other colors used as gems, such as blue Aquamarine, yellow Heliodor and Golden Beryl, pink Morganite, Red Beryl or Bixbite, and the colorless variety, Goshenite. 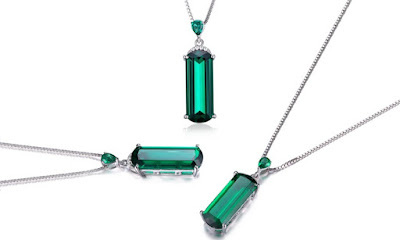 Emerald is an excellent stone for reviving passion, whether for an interest, a person, or a job. To attract romantic love, wear or carry an Emerald out of sight near the heart. To call back an estranged love, speak the words you wish to say holding the stone close to your lips and seal it in an envelope. If appropriate, send it to the person with a message. In tumblestone form, Emerald promotes good self-esteem, especially in restoring the confidence of young girls or teens that have been teased about their weight, or any young person made to feel inferior due to the inability to afford the latest designer goods. While Emerald has a calming effect on the emotions, it has an invigorating effect on thought, reflection, and philosophy. It is a marvelous crystal for activating artistic creativity, and for bringing focus and intensity to one’s lifework. Emerald is a remarkable support stone for the workplace. It increases mental acuity, strengthens memory and inspires eloquence in speech. 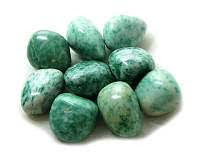 Natural Emerald or tumblestone held for five minutes a day brings rapid recall of facts, and is ideal for occupations where visionary insight is a significant benefit. It enkindles success in business, especially for older women, and is particularly known for assistance in areas of legal affairs, trials and litigation. Emerald brings a soothing mental and emotional equilibrium, making it extremely beneficial in stimulating cooperation and understanding within a group of people. It is also helpful in relieving claustrophobia. Emerald imparts a wonderful rejuvenating quality, thought to combat aging and when placed appropriately, to re-vitalize tired organs. It is a strong healer of the physical heart, and may be useful in treating the lungs, liver, gall bladder, pancreas and kidneys, as well as the spine and muscle system. It aids recovery after infectious illness, and its powerful green ray can assist healing of malignant conditions. Emerald is considered to be the best gem for treating the eyes and for restoring eyesight. An eye bath of Emerald water is soothing to the eyes and may alleviate eye infections. Drinking an Emerald elixir is also reputed to soothe gas and cardiac weaknesses, and is an excellent stimulant in treating gout and strengthening memory. This stone is believed to ward off epilepsy, and may be used to avert fever, headaches, allergies and sinusitis. It also relieves eczema, rashes and skin irritations. Emerald may be used to increase fertility and for support during childbirth. Emerald is a crystal of the heart, alleviating heaviness in the emotional field and nourishing the aura with an energy of hope, encouragement, gentleness and abundance. It heals heartbreak and gives the strength needed to overcome the misfortunes of life, clearing away negative patterns of victimization and loss of personal power by strengthening the physical and emotional heart centers. It is a stone of regeneration and recovery, bringing in freshness and vitality, love and compassion - for the self as well as for others. Emerald is the stone which most represents the energy patterns of the activated Heart Chakra, the wellspring of the emotions. The Heart Chakra is located near the center of the breastbone. It regulates our interaction with the external world and controls what we embrace and what we resist, giving us the balancing ability to be ourselves within the environment. When the Heart Chakra is out of balance we may feel either controlling or controlled in a relationship, and become critical of the little foibles of others. We may find ourselves having inappropriately strong emotional responses to everyday external stimuli. Green crystal energy is used to resolve blockages and to re-balance the Heart Chakra, helping us understand our own needs and emotions clearly. We can deal with the ebbs and flows of emotional relationships, understand their cyclic nature, and accept the changes. Emerald also stimulates the high heart, or transpersonal Love center just above and to the left of the Heart Chakra. It assists one in practicing compassion and respectful understanding of others. A stone of aspiration and inspiration, Emerald opens the heart, clearing and strengthening one’s connection to Divine Love, and sustaining one in their spiritual journey. It encourages one to live and act from the heart, offering unconditional love and compassion in daily life and relationships, and to be open to receive love from others. A strong and open heart also allows universal blessings to flow into one’s life. Emerald stimulates not only the hope of wealth in material possessions and financial standing, but allows one to experience true abundance beyond mere wealth. Abundance is the ability to receive the gifts of Spirit within all of life’s experiences and embrace its manifestations with gratitude. It encourages trust that the Universe will provide for all of one’s needs and that there can be no lack in reality. 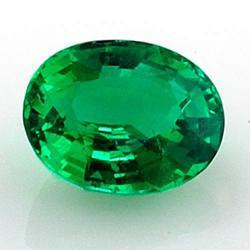 Emerald is the purest crystal of the Green Ray. It is a growth crystal - a powerful conduit of the earth’s Life Force of birth, development and creation, and of the power of nature’s constant renewal. It is a potent aid in nurturing, whether of fledgling family relationships or a new business venture. Emerald is perfect for keeping a venture on course, a project on schedule, and life on track. Lighter Green crystals promote spiritual growth and renewed commitment to a higher purpose. Those of a darker hue are talismans of physical growth and strength, and safety in travel. Emerald helps one to embrace and maintain the rhythmic breathing conducive to entering and attaining depth in the meditative state. Once achieved, it assists in maintaining the cool brilliance of deliberate reflection and emitting the radiance of light. As I love the crystal and so I keep wonderful collection of crystal related books. I always keep reading and surfing on internet also, so I have gather many information and also done practical experience about the crystal energy. I have enjoyed the benefit of crystal healing, but any information on uses and properties included with this listing (which has been gathered from reputable sources, such as Judy Hall and Michael Gienger's books on crystal healing etc) do not, under any circumstances, constitute a claim on behalf of the Seller. The information given is not intended to act as a substitute for medical treatment, nor will any guarantees be given for any spiritual or metaphysical qualities. Jennifer Altman, Gem and Stone: Jewelry of Earth, Sea, and Sky. Melody, Love Is In The Earth. © Copyright By Kalpesh Dave. Powered by Blogger.